Today’s SolidWorks Video Tip shows an example of how you can use ScanTo3D to extract surface data from mesh files. This example was inspired by a file I recently helped fellow Blogger Mike Puckett with. ScanTo3D is part of SolidWorks Premium. It allows users to open Point Cloud and Mesh data in various formats with a toolset that enables users to construct solid or surface models based on triangulated mesh data. Click on the image below to access the video tip. Great video, never knew the ScanTo3D tool was there. question though isn't a STL file a STL? how is it different from the “stand alone” drop down to the “mesh” drop down. The standalone drop down is the “legacy” option we have had for quite some time. In the Import settings you can set the legacy option to open STL file either as “Graphics Body”, “Surfaces”, or “Solids”. The latter two options will cause the file to be VERY VERY slow. If you don't have ScanTo3D you can use this legacy option to open STL files but it is really impractical to use this option for anything other than viewing. If you do use it for viewing, make sure you have the Graphics Body option set. 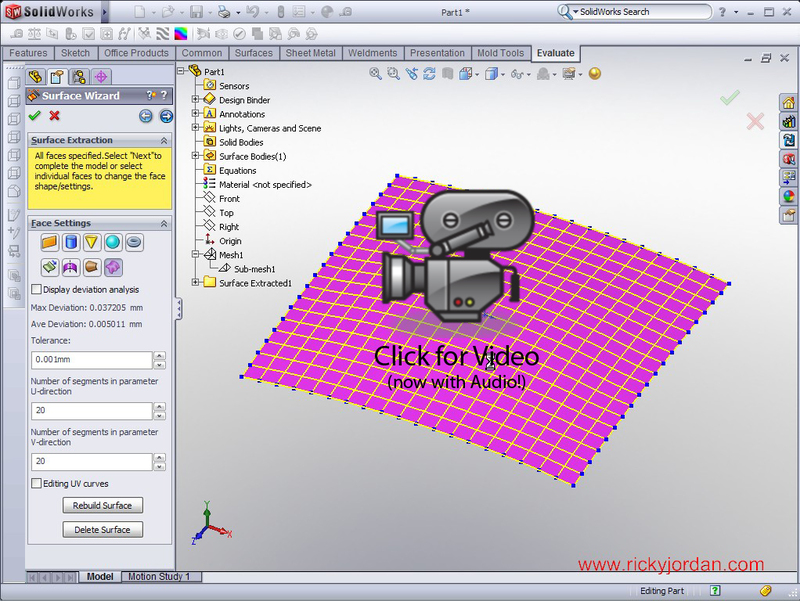 ScanTo3D adds the “Mesh Files” drop down which allows you to open the file using the ScanTo3D software. The mesh data opened in ScanTo3D are much “lighter” in that it doesn't bogg down the software as much as the legacy option. The biggest advantage of ScanTo3D software is what you can do with the mesh data. You can offset, scale, and move meshes. You can also run the mesh through a wizard which allows you to redefine several aspects of the mesh composition. Once you have the mesh where you want it, you can then use the surfacing wizard which I showed in the video. You are right in that an STL is an STL. The two drop down options simple represent two different “software solutions” within SolidWorks that obviously have some differences in capabilities. Thank you for the explanation I defiantly need to look into this feature, could be interesting to see how verified STL files from Mastercam would look. Thanks again. hi mate, just watched your video and it was really detailed and helpful. However, what I'm trying to do is a little different and I'm new with SolidWorks so I'm not getting anywhere very fast. I'm using the ScanTo3D addin but I'm using it to model an artery. 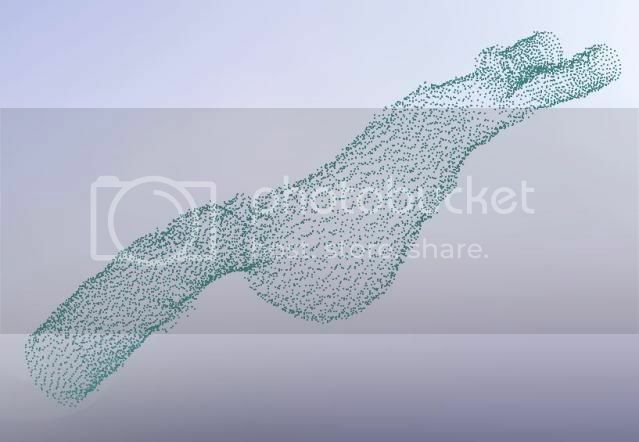 I have the coordinates in a point file and importing the pointcloud generates this: http://i204.photobucket.com/albums/bb264/domlad… I've tried about 15 times to generate a solid from this but I can only get it to be hollow. My supervisor (for my degree) managed to get it solid but that was just luck through clickin a lot of options and even he cant remember how he managed to do it. So I know its possible but cant figure it out. I asked online elsewhere and I was given 2 links, one for this and one for CadDigest with the only link regarding ScanTo3D directing here. Please could help me out, I'd be extremely grateful. You'll need to using the Mesh Wizard to first create the Mesh. You will have to step through the wizard and fill any “Holes” that may appear. Once you have completed the Mesh Wizard, you can run the Surfacing Wizard and try the AutoSurfacing option. Try running it with a low to medium number of faces and you should get some decent results. Hemp is is far more than a psychoactive drug. And indeed the perfect food, and when learned. Go to http://www.hempproteinguide.net/ for great information. The presentation is very nice. Can you also show extraction of surface (top view) coordinates and save it to an excel file (with 3 columns of data: x, y, z)? Thank you very much.